Here at Attack Pest Control we know how bothersome and distressing it can be to be infested with fleas and we are here ready to help. We have fully trained staff with years of experence to help solve your problem. Please contact our local office and we can discuss your problem. You will come to us as a customer and we leave as a friend. 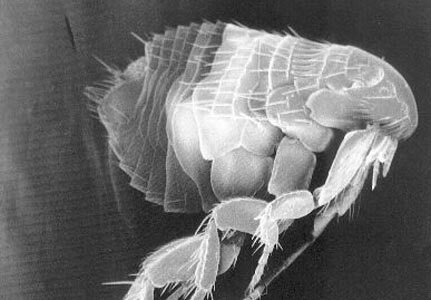 Fleas are wingless insects (1/16 to 1/8-inch (1.5 to 3.3 mm) long) that are agile, usually dark colored (for example, the reddish-brown of the cat flea), with tube-like mouth-parts adapted to feeding on the blood of their hosts. Their legs are long, the hind pair well adapted for jumping: a flea can jump vertically up to 7 inches (18 cm) and horizontally up to 13 inches (33 cm). This is around 200 times their own body length, making the flea one of the best jumpers of all known animals (relative to body size), second only to the frog-hopper. According to an article in Science News, “researchers with the University of Cambridge in England have shown that fleas take off from their tibiae and tarsi—the insect equivalent of feet—and not their trochantera, or knees. The researchers report their conclusion in the March 1 Journal of Experimental Biology.”t has been known that fleas do not use muscle power but energy stored in a protein named resilin but the researchers used high-speed video technology and mathematical models to discover where the spring action actually happens. Their bodies are laterally compressed, permitting easy movement through the hairs or feathers on the host’s body (or in the case of humans, under clothing). The flea body is hard, polished, and covered with many hairs and short spines directed backward,which also assist its movements on the host. The tough body is able to withstand great pressure, likely an adaptation to survive attempts to eliminate them by mashing or scratching. Even hard squeezing between the fingers is normally insufficient to kill a flea. It is possible to eliminate them by pressing individual fleas with adhesive tape or softened beeswax (or “cheese” wax) or by rolling a flea briskly between the fingers to disable it then crushing it between the fingernails. Fleas also can be drowned in water and may not survive direct contact with anti-flea pesticides. Fleas lay tiny white oval-shaped eggs better viewed through a loupe. The larva is small, pale, has bristles covering its worm-like body, lacks eyes, and has mouthparts adapted to chewing. The larvae feed on various organic matter, especially the feces of mature fleas. The adult flea’s diet consists solely of fresh blood. In the pupal phase, the larva is enclosed in a silken, debris-covered cocoon. Fleas are holometabolous insects, going through the four life cycle stages of egg, larva, pupa and adult . The flea life cycle begins when the female lays after feeding. Adult fleas must feed on blood before they can become capable of reproduction.Eggs are laid in batches of up to 20 or so, usually on the host itself, which means that the eggs can easily roll onto the ground. Because of this, areas where the host rests and sleeps become one of the primary habitats of eggs and developing fleas. The eggs take around two days to two weeks to hatch. Flea larvae emerge from the eggs to feed on any available organic material such as dead insects, feces, and vegetable matter. They are blind and avoid sunlight, keeping to dark places like sand, cracks and crevices, and bedding. Given an adequate supply of food, larvae should pupate and weave a silken cocoon within 1–2 weeks after 3 larval stages. After another week or two, the adult flea is fully developed and ready to emerge from the cocoon. They may however remain resting during this period until they receive a signal that a host is near – vibrations (including sound), heat, and carbon dioxide are all stimuli indicating the probable presence of a host. [Fleas are known to overwinter in the larval or pupal stages. Once the flea reaches adulthood, its primary goal is to find blood and then to reproduce. Adult fleas only have about a week to find food once they emerge, but after that they can survive two months to a year between meals. Flea populations are unevenly distributed, with about 50% eggs, 35% larvae, 10% pupae, and 5% adults. Their total life cycle can be as short as two weeks, but may be several months in ideal conditions. Female fleas can lay 500 or more eggs over their life, allowing for phenomenal growth rates. Adult female rabbit fleas, Spilopsyllus cuniculi, can detect the changing levels of cortisol and corticosterone, hormones in the rabbit’s blood that indicate she is getting close to giving birth. This triggers sexual maturity in the fleas and they start producing eggs. As soon as the baby rabbits are born, the fleas make their way down to them and once on board they start feeding, mating, and laying eggs. After 12 days, the adult fleas make their way back to the mother. They complete this mini-migration every time she gives birth. Newly emerged adult fleas live only about one week if a blood meal is not obtained. However, completely developed adult fleas can live for several months without eating, so long as they do not emerge from their puparia. Optimum temperatures for the flea’s life cycle are 70°F to 85°F (21°C to 30°C) and optimum humidity is 70%. Here at Attack Pest Control we are here to help rid you flea infestation.